OCast fegado, Eng liver. Liver or yellow bile was considered a one of the four humors in the human body. Nutmeg and walnuts were thought to fortify the liver. The Archipriest of Hita explains that in 14th century Spain, mutton livers were commonly eaten with rhubarb for lunch. Gastronomically, pork liver includes the fat. It is used in cachuelos (typical meals served during the slaughter of livestock in Spain consisting of entrails as they spoil almost immediately if not pickled or preserved in some way as in stuffing for tripe various types of sausages and pate. Livers were commonly added to pottages with eggs and vinegar. 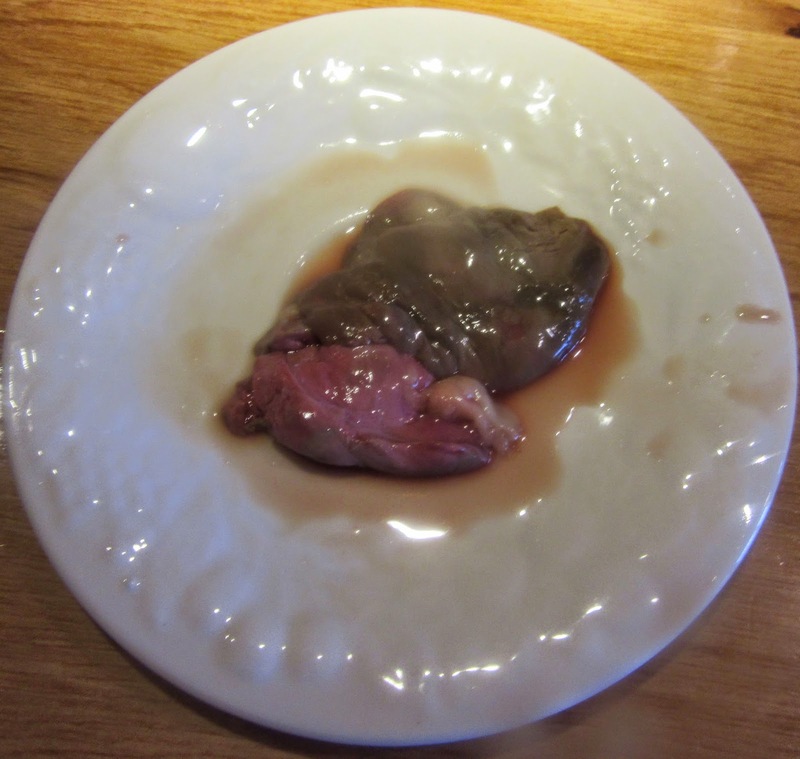 Sent Soví provides a recipe for Moxeric, a sweet and sour liver sauce served with fowl. Rub the chicken inside and out with salt. Mash a bouillon cube and rub in on the inside of the chicken. 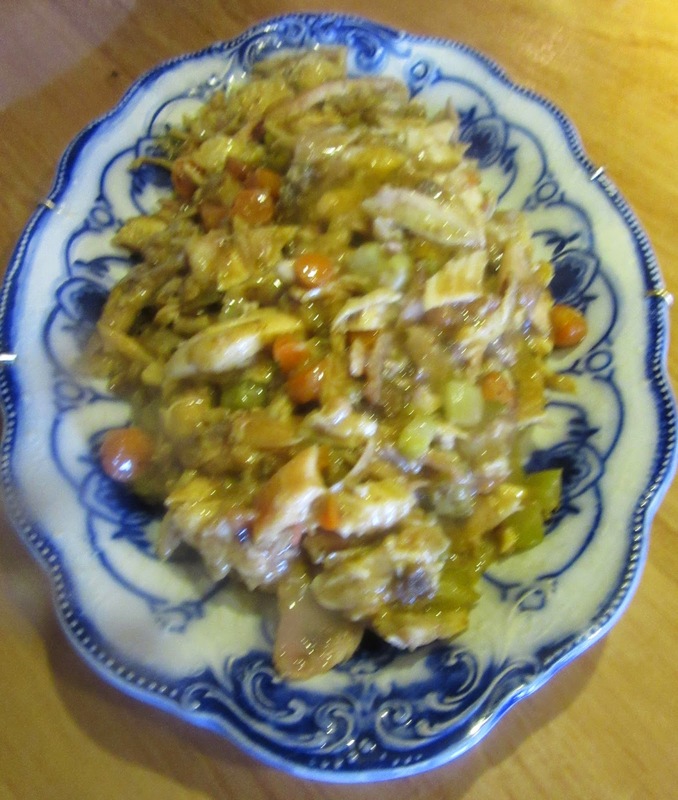 Put chopped carrot and celery inside the cavity and bake the chicken for 40 minutes. Place water in a frying pan and bring to a boil. Reduce to simmer. 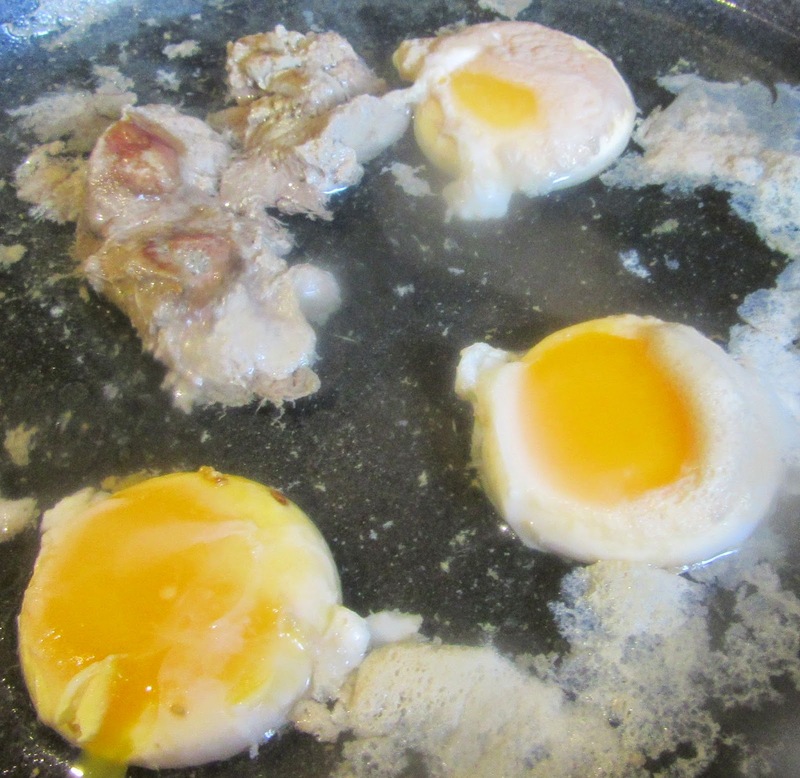 Pouch liver and egg yolks until done, about 8 minutes. Remove from water and put them in a food processor. Remove the crust from the bread and soak in vinegar. Add this to the food processor with chicken broth, spices and honey. Blend this and pour it into a saucepan. Bring to a boil stirring non-stop, reduce heat to simmer and let it cook gently until the chicken is ready. Carve chicken according to Villena’s instructions. Remove the appendages and slice the breast. Put this in a pot and pour the sauce over it with juices from the roast. Simmer 10-15 minutes. Adjust seasoning if required. Si vols ffer moxerich a gualines en ast, prenets les gualines, e sien netament apereyllades e netes, e matetsles en ast, e coguen. E quant seran mig cuytes, ayats hours cuyts en aygua, e los [205v] fetges de les gualines, e un poc de pa torrat remullat en vinagra; e picats-ho tot encamps bé. Puys ayats cansalada, qui cogua en una olla; e quant serà cuyta, exatats la salsa ab lo brou, e vaya en una bella olla. Puys destrempats les espícies, e vagen dins; e matets-hi un poc de vinagre, e matets-hi de bona mel ho de bon arop. Puyss ffèts cortés de les gualines, e vagen en la olla hon serà la salsa; e posats-la al ffoc, e bulla tro que sia bé espessa. E testats-ho de sal e ffèts per guissa que sàpia a vinegre, mas més que més sápia a la dolsor. Puys ffèts.ne escudellles ab les gualnies encamps. Les espícies són aquestes; les 11 parts de gingebre, e la tersa de pebre, e un poch de canyella e de saffrà, per guiissa que sia bé colorat lo moxerich. If you want to make moxeric with roast hens, take the hens, have them prepared and cleaned, and put them on a spit, and cook them. And when they are half-cooked, take hard-boiled eggs [in the other recipe, yolks only] and the livers of the hens, poached, a a piece of toasted bread soaked in vinegar; and pound all these together. –then take salted pork that has been boiled, add some of the liquid to the mixture. Then add the spices and add a little vinegar, and honey or syrup. Quarter the hens, add to the pot with the sauce, cook till thick. Taste for salt, and make sure you can taste the vinegar, although it should be predominately sweet. Then serve it in shallow bowls. The spices are these: 2 parts ginger, one part pepper, a little cinnamon and saffron so that it is well coloured. moxerich, guisat per a gallines o aus, en el qual aquestes acaben de coure’s en una salsa agredolça feta amb rovelle d’ous durs, fetges i espècies. Aquesta paraula és probablement d’origen árab. No figura en V ni l’hem trobada a les altres llegües romànques. Los: B “al.” Corregim per exigència de la concordança. fféts cortés: ‘feu quarters’, ‘tallen quarters’.